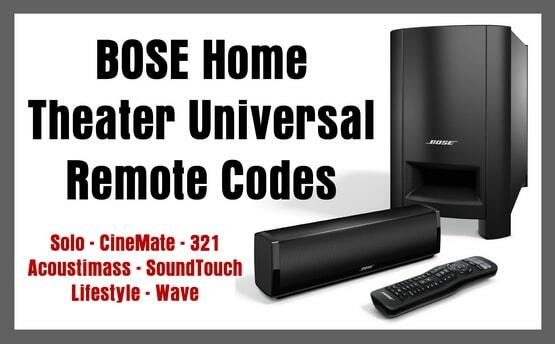 If you have a BOSE Home Theater (Solo, CineMate, 321, Acoustimass, SoundTouch, Lifestyle, Wave) and want to control it with a universal remote control, we have the codes needed. A BOSE Home Theater can be controlled with any universal remote if you have the correct programming guide and the correct remote codes for the sound bar. If the codes below do not work with your BOSE Home Theater, please leave a comment below with the model number of your remote control and we will find you the correct remote code. Program your universal remote control to a BOSE Home Theater. Use the following 4 and 5 digit remote codes. NOTE: Bose systems are set to RF commands by default. Go into the menu of the Bose system and change the settings so it can accept infrared remote IR commands. All remote codes reported working with BOSE Home Theater: Bose CineMate GS Series II, Bose 123 audio system, Bose Acoustimass 10 Series IV Home Entertainment Speaker System, Bose SoundTouch, Bose Lifestyle SoundTouch 535 Entertainment System, Bose CineMate Series II Digital Home Theater Speaker System, and more. Need more help programming your remote to your BOSE Home Theater? Please leave questions below. I have Dish Network and want to use the remote control from Dish to control my Bose SoundTouch 520. I have try every code I see but can only get it to mute the Bose system. I have a GA935WJSA remote for a Sharp Aquos TV and want to program it for my Bose 321 Series II sound system, but it won’t take any of these codes. I haven’t been able to find one anywhere that will work. Can anyone help me? I have a BOSE Lifestyle 650. Do you have the RF codes to control it? I think my Bose 3-2-1 home theater remote has quite working. I order a bose universal remote. The original remote would not advance the tracking function. Can the new remote (universal) be used for the 3-2-1 home theater system. If so what would be the code needed to program. My Bose Cinemate series ii digital home theatre system is not responding to my Mitsubishi Remote Control. The mitsubishi remote will not light up for some of the numbers I try to enter. I have a Bose solo 15 and would like to control it with the One For All urc-3445 universal remote controller. I can’t find a code that will work with it. Hi there, I have a Bose cinemate system and I’d like to program my remote to work with my tv which is a lot newer so I need a code for a Philips smart tv – I’m not the most talented techie- HELP LOL! My remote is a Tan 804 b. I need a remote code to work my Bose cinemate series 2. 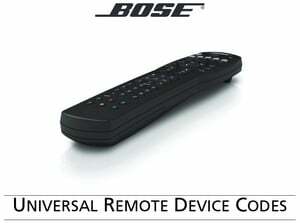 Check the BOSE Universal Remote Codes page here. I have a Bose Solo attached to my Samsung PN59D550C1F TV. I cannot get my Bose Remote to control the TV. Everywhere I look, it says to use code 0060. Remote does not respond. The remote works on the Solo and for my TIVO box, but. Nothing on TV. Can you give me any advise? The Remote manual says to try auto scan, but doesn’t say how to do that. I’m trying to control my Bose Cinemate 130 with my ATT Uverse remote model S10-S4. Do you have any idea what code the Cinemate 130 is? I have just purchased a new Samsung Blu Ray Player and want to control it with the remote from my BOSE Lifestyle 48. I can’t seem to get any of the BOSE built-in codes to work?